EAST VILLAGE — The longstanding Bowery Poetry Club will have a new look — and a new name — when it reopens in March. Founder Bob Holman said the new Bowery Poetry at 308 Bowery will be dropping the word "club" from its name — in a bid to eliminate confusion among those who thought the venue had anything to do with membership. It also comes down to a choice of word rhythm, he said. "As a poet, 'club' kind of just sticks out like a thumb," Holman said. "These are the sort of things that poets spend a lot of time thinking about." Along with a shortened name, Bowery Poetry will also refine its focus — starting with its unofficial grand opening event on March 18. "We will be more poetry centric and project driven," said Holman, who has scheduled a huge concert, poetry slam and dance for March 18 in celebration of two endangered foreign languages — Breton, a Celtic tongue, and Garifuna, from Central America. "I am really ready to see this event because nothing like this has ever been done," he said. The event, titled a "Breton Garifuna Party" will bring together speakers of the two languages, of which there are many in the city, according to Holman, for an international celebration of languages. "You will have musicians from both camps — the Celtic music, the Afro-Caribbean music," said Holman. "And hopefully the musicians will jam together and it will be something the world has never heard." Bowery Poetry, a beloved neighborhood beacon for the spoken word since 2002, will also have a renovated look more in keeping with the extravagant style of its new partner, TriBeCa burlesque venue Duane Park. Duane Park owner Marisa Ferrarin, a longtime friend of Holman, had operated out of a TriBeCa venue for 25 years, but under a deal to help both venues will be moving into the Bowery site with Bowery Poetry. "I am glad that we have found a model that is sustainable. At least I think it will be sustainable," said Holman, a poet who has lived in New York City since the 1970s. Under the deal, 308 Bowery will operate as a burlesque venue Tuesday through Saturday. 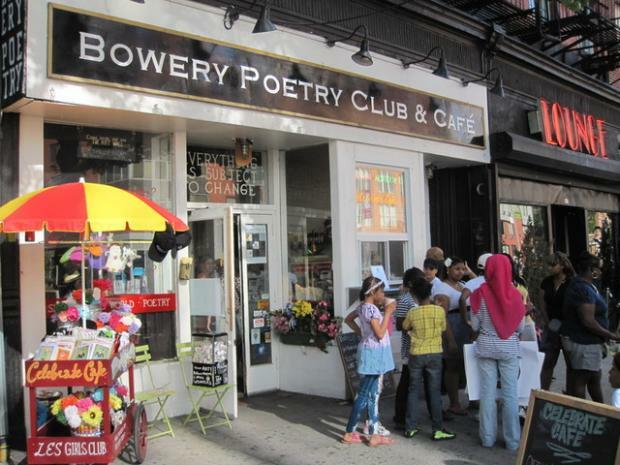 Bowery Poetry will operate Saturday afternoons, Sunday and Monday. Duane Park is looking at a private opening on March 7, Holman said.